In addition to multi-national Grid infrastructures, several countries operate their own national Grid infrastructures to support science and industry within national borders. These infrastructures have the benefit of better satisfying the needs of local, regional and national user communities. 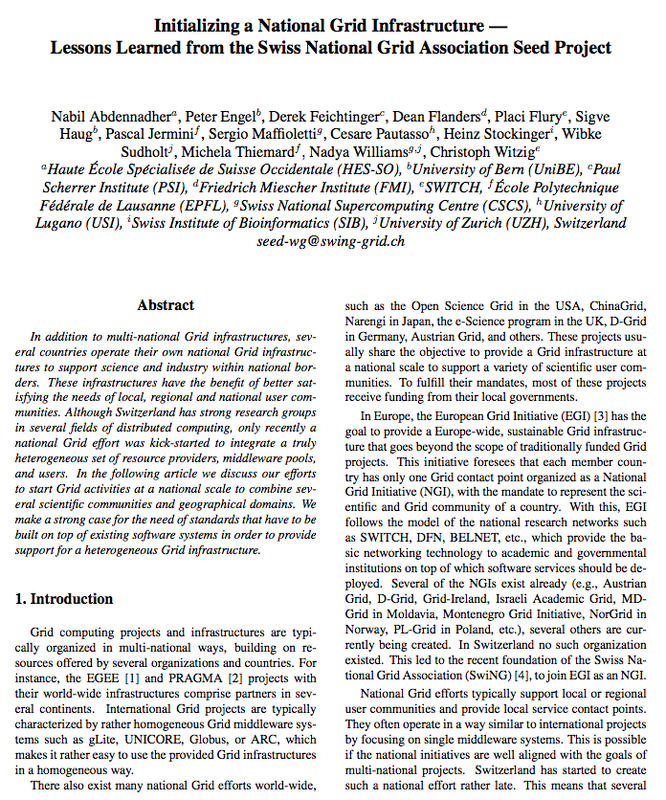 Although Switzerland has strong research groups in several fields of distributed computing, only recently a national Grid effort was kick-started to integrate a truly heterogeneous set of resource providers, middleware pools, and users. In the following article we discuss our efforts to start Grid activities at a national scale to combine several scientific communities and geographical domains. We make a strong case for the need of standards that have to be built on top of existing software systems in order to provide support for a heterogeneous Grid infrastructure.